New laws could be coming that might affect your life. Traffic cameras at red lights; city and federal elections on the same day; or outlawing prostitution. All of them are new laws to be considered by state lawmakers, who started their bi-annual session this week. Among the other bills to be considered: background checks for firearms; outlawing the death penalty; and a new way to distribute taxes for schools. Rory Reid, former Democratic candidate for governor, and Warren Hardy, former Republican state senator, join State of Nevada to talk about the issues. One bill being considered by the Legislature would try to lower the cost of prescription drugs by setting up a state pharmacy. Is this a good idea? Reid: They’ve put pressure on themselves to do something about health care by saying it would be a priority during the campaign. But Governor Steve Sisolak has essentially inherited a budget from former Governor Brian Sandoval, which limits what he can do. This is something he can do. Hardy: It is really the only thing the Legislature can do. I question whether it’s the right approach and whether it will actually save money. It is difficult to find a solution so the legislator who introduced it is grasping at something to do something and I think that’s helpful because it starts a conversation. One bill being considered would eliminate the death penalty in Nevada. Will this pass? Reid: Gov. Steve Sisolak is a religious man. He takes his Catholicism seriously. While on the Clark County Commission together, we never sat around and talked about the death penalty. We talked about potholes and where the streets should go. I’ve never spoken with the governor about that. I do know his faith is important to him and that puts him in a pickle because he’s got the politics of the issue and his faith and it will be interesting to see what he does. Republicans are seen as being tough on crime – historically – so would the desire to look tough on crime stop Republicans for voting on this? Hardy: Yes. The tough on crime approach does work. The death penalty is a tough one. I think we’re at a place technologically where we could safely have the death penalty with DNA and everything else. I wouldn’t want to take it out of the toolbox of law enforcement, but I think we need to, as a state, be very compassionate and reasonable in how we approach the death penalty. One of the biggest tasks ahead for the Legislature could be the reconfiguring of the state’s funding formula for education. Clark County has complained for years that it generated more money for the state but didn’t get the taxes back – especially for higher need schools in urban areas. Will the funding formula get fixed? Hardy: That is a debate that is long, long overdue that has never been a partisan, Republican versus Democrat, that has always been a north-rural versus south question. The political power in the state for most of the years I’ve been involved in politics has resided in the north end of the state. It has nothing to do with the Democrats being in charge. It has to do with the South being in charge. Those things need to be corrected. It is a matter of equity… Introduce a piece of legislation called the education equity act and get a fiscal note to figure out how much it’s going to cost to bring the south on par with the north and the rurals. And you’re going to be astonished. It is not a desire to run [rural Nevada] over. It is not a desire to yank the rug out from under them but there is a desire to make sure our education funding and policies are equitable to the entire state. Reid: Our funding formula was written in the 60s. It is one of the oldest funding formulas in the United States of America. It makes absolutely no sense. If you are a kid in Nevada and you have a learning disability or you don’t speak English or you’re poor the funding formula doesn’t acknowledge that. All it speaks to is how far you are from your school. It weights the amount of money you receive based on transportation costs and nothing else. We need to have a cost-based funding formula in Nevada where the amount of money allocated to a kid is based on the particular factors that confront that kid’s education. Can the funding formula be changed in 120 days? Hardy: No. We know the problem but it is going to take a while to implement because we have to do this without doing – for a lack of a better word – violence to the rurals and the north. It is not going to get done in 120 days but we need to move in that direction starting immediately. This is really the first time in my political career that the political stars are aligned to fix it. Reid: Here is where the rub is going to be and here is where Warren and I are probably going to disagree. The real problem isn’t that we have a 120-day legislative session. The real problem is this is going to cost money. Real money. If we do what I describe and have a cost-based funding formula and we do it in an equitable way. It’s going to cost more money and that’s where the trouble will be. Hardy: I think there is a lot we can do that is revenue neutral to move us in that direction policy-wise, especially at higher ed. The taxpayers of this state have always been willing to fund education but now we are to a point where we ought to have some conversations about stewardship of that money and accountability of what we are currently spending. 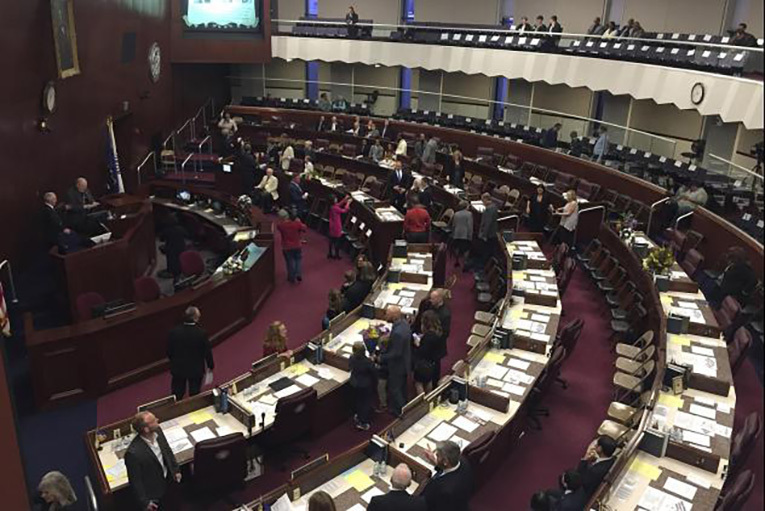 Is it time for Nevada to switch to an annual instead of a bi-annual Legislature? Reid: Absolutely. It makes no sense the way we do it. They have a lot to do and 120 days to do it… We don’t pay them anything. We give them an impossible task and then we are upset when their work isn’t spectacularly done. Hardy: The real challenge is the budget. We’re a large state now in terms of our budget. I think we need to follow the Utah model, which has a 60 budgetary session every other year. And then 120 policy plus budget. Reid: Who in the world does their budget like the state of Nevada? Nobody. You make a two-year guess about how much money you’re going to have and then you spend it before you know you’re actually going to have it. Nobody does that. Another bill would allow state workers to join or form unions and participate in collective bargaining. Is that a good idea? Hardy: There are some things you can count on in life: you’re going to pay taxes, you’re going to die, the sun is going to come up tomorrow and — that bill is going to pass. That bill is something the Democrats have been after the entire time I’ve been in the Legislature. Schoenmann: Why don’t you support it? Hardy: Because the cost of public employment always goes up when you do it. We’re to blame because we didn’t fix the underlying problem. State employees don’t make enough money… We’re constantly training and not paying enough. We’re a victim of our own inaction those of us who haven’t supported it in the past because had we provided the kind of salaries that state employees should have we probably would not be having this discussion. You support the bill but the wages for state employees would go up. Where would the money come from for increased wages? Reid: I think you need to consider the cost of not doing it… State workers are asked too much for too little. They, I think, don’t believe there is anyway their wages will increase unless they can bargain collectively. This prospect is the only hope they believe they have for fair wages.